Jackson State Forest to log on steep and unstable slopes SE of Fort Bragg, CA. This THP is about 8 miles SE of Fort Bragg, CA, and a few miles north of Highway 20 in Jackson State Forest at an elevation of 160 to 1,160 feet. Jackson State Forest is planning a mostly selection tractor and cable logging operation on steep and unstable slopes in redwood, Douglas fir, grand fir and western hemlock forests. 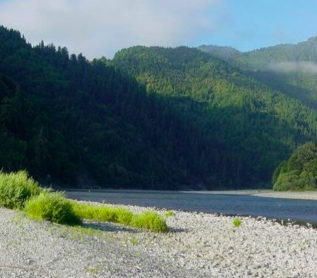 The THP area flows into the Noyo River which is listed as an impaired watershed for sediment and temperature. There are 21 landslide terrain sites including; multiple debris slide slopes, debris flows, and debris torrents, 2 fill slope failures along the Indian Springs Road, 2 cut bank failures along the 340 Road, and several other road related fill failures. 5 temporary roads and 4 landings are proposed for construction inside a class I (year round) watercourse area off roads 300 and 340. 30 road drainage sites are planned for work including rocking, dip construction, ditch cleaning and culvert repair/replacement. 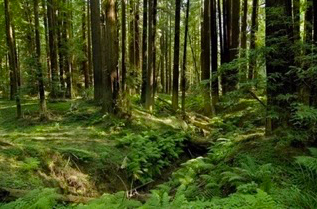 There is marbled murrelet habitat (pentagon grove) within .25 miles of the THP area, and 3 spotted owl nesting territories within .7 miles of the THP area. Humboldt milk vetch was reported along roads 330, 334, 345 and 336, and 1 occurrence of white flowered rein orchid was found along a PG&E access road. Humboldt Redwood Company to log on steep and unstable slopes NE of Fortuna, CA. This THP is about 8 miles NE of Fortuna, CA and about 6.62 miles NE of Carlotta, CA at an elevation of 600 to 1,975 feet. Humboldt Redwood Company is planning a mostly group selection tractor and cable logging operation in redwood, Douglas fir and grand fir forests. The THP area flows into the Van Duzen River which is listed as an impaired watershed for sediment/sedimentation and temperature. There are 51 unstable areas including; multiple debris slides, debris flows, earth flows, disrupted ground and steep inner gorges, and 6 road failure sites including; multiple cut bank and fill slope failures. 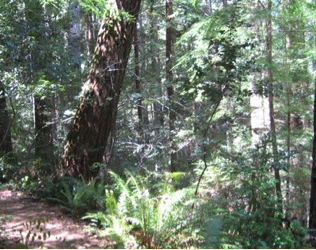 Humboldt Redwood Company is planning to use ground based equipment on slopes between 50% and 65% grade with a moderate erosion hazard, use an existing landing inside a class I (year round) watercourse area, and use ground based equipment on existing skid trails within unstable areas at 6 locations. 33 road drainage sites are planned for work including rocking, dip construction, ditch cleaning, culvert repair/replacement and restoration of washed out crossings. Portions of unit 1 and several haul roads are within .25 miles of designated marbled murrelet habitat areas, and there are 2 spotted owl nesting territories within 1.3 miles of the THP area. 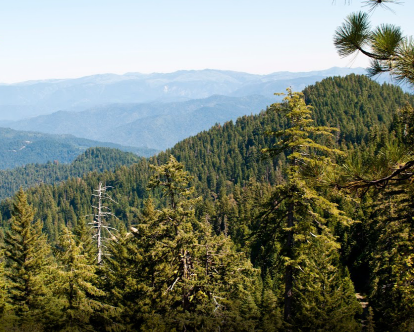 Green Diamond Resource Company to clearcut log east of Redwood National Park. This THP is about 8 miles south of Klamath, CA, 8 miles NE of Orick, CA, and about a mile east of Redwood National Park at an elevation of 90 to 1,460 feet. Green Diamond Resource Company is planning a mostly clearcut tractor and cable logging operation on steep and unstable slopes in redwood, Douglas fir, grand fir, western hemlock and Sitka spruce forests. The THP area flows into the Lower Klamath River which is listed as an impaired watershed for sediment, temperature, nutrients and dissolved oxygen. There are 5 unstable areas in unit B including; 4 shallow rapid landslide terrain sites and 1 deep seated landslide terrain site. Green Diamond Resource Company is planning to use a seasonal road inside a class II (mid sized) watercourse area for yarding, decking and loading operations near unit B, and construct a segment of temporary steep road to access unit C that exceeds 20% grade for approximately 100 feet. 11 road drainage sites are planned for work including rocking, dip construction, ditch cleaning and culvert repair/replacement. Bald eagle nests are located .8 miles NE of unit E, and greater than 1 mile from the THP area along the Klamath River. Two osprey nests are located within the THP area including; a nest within .25 miles of unit E and several haul roads, and a second nest within .25 miles of units E and F, and several haul roads. Potential marbled murrelet habitat exists on Redwood National Park lands within .25 miles of the CL North Road. There is a great blue heron rockery .5 miles SE of unit F along the Klamath River, and foothill yellow legged frogs and coastal tailed frogs are known to occur in Ah Pah Creek adjacent to unit F. Spotted owl nesting territories are located within .25 miles of units C, D and F, within .5 miles of units A and B.
Humboldt Redwood Company to log trees up to 48” dbh west of Scotia, CA. 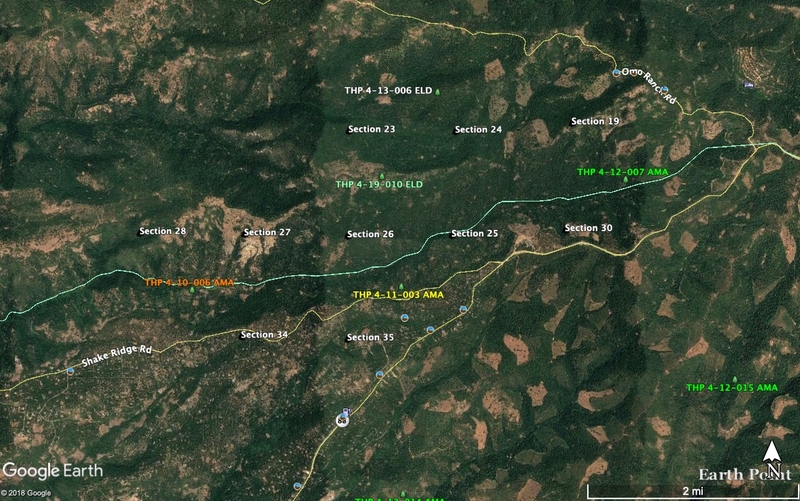 This THP is about a mile west of Scotia, CA, Highway 101 and the Eel River at an elevation of 420 to 980 feet. Humboldt Redwood Company is planning a mostly group selection tractor and cable logging operation on steep and unstable slopes in redwood, Douglas fir and grand fir forests. The THP area flows into the Eel River which is listed as an impaired watershed for sediment and temperature. There are 6 landslide terrain sites and road related failures including; multiple debris slides, disrupted ground and cut bank failures. Two road drainage sites are planned for work including rocking, dip construction, ditch cleaning and culvert repair/replacement. There are 5 spotted owl nesting territories within 1.3 miles of the THP area. Mendocino Redwood Company to log by Comptche, CA SE of Mendocino, CA. This THP is about 9 miles SE of Mendocino, CA and Highway 1, and about 1 mile south of Comptche, CA at an elevation of 240 to 920 feet. 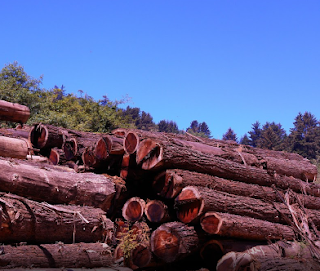 Mendocino Redwood Company is planning a mostly group selection tractor and cable logging operation on steep and unstable slopes in redwood, grand fir, western hemlock and Douglas fir forests. The THP area flows into the Albion River which is listed as an impaired watershed for sediment and temperature. There are 4 unstable areas including multiple debris slides and shallow rapid landslide terrain sites. Ground based equipment is proposed for use on slopes between 50% and 65% grade with a moderate erosion hazard. 52 road drainage sites are planned for work including rocking, dip construction, ditch cleaning and culvert repair/replacement. Bolander’s reed grass was reported along 2 roads in the western portion of the THP area, and Old man’s beard was reported in a tree along a haul route. There is marbled murrelet habitat 1.5 miles north of the THP area, and 3 spotted owl nesting territories within .7 miles of the THP area. 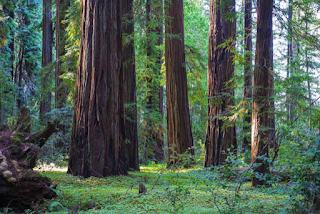 Humboldt Redwood Company to log north of Honeydew, CA and the Mattole River. Google Earth Photo by Chris Blampied. This THP is about 8 miles SW of Red Crest, CA and Highway 101, and about 5 miles north of Honeydew, CA at an elevation of 1,160 to 3,440 feet. Humboldt Redwood Company is planning a mostly group selection and selection tractor and cable logging operation on steep and unstable slopes in Douglas fir forests. 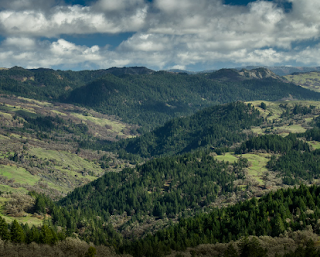 The THP area flows into the Mattole River which is listed as an impaired watershed for sediment and temperature. There are 123 landslide terrain sites including; multiple debris slides, debris slide slopes, steep inner gorges, earth flows, debris flows, disrupted ground, and steep headwall swales, and 5 road failure sites including 2 cut bank failures, 2 fill slope failures, and 1 road related debris slide. 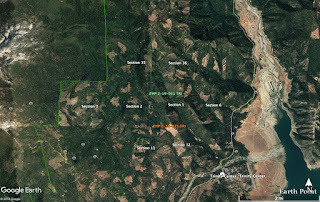 Humboldt Redwood Company is planning to use ground based equipment in areas designated for cable logging, and use ground based equipment across an unstable area on road D73.29 in unit 1. They also are requesting an exception to be able to harvest visual retention trees prior to the required 50 year rest cycle. 66 road drainage sites are planned for work including rocking, dip construction, ditch cleaning and culvert repair/replacement. There are 5 spotted owl nesting territories within 1.3 miles of the THP area. 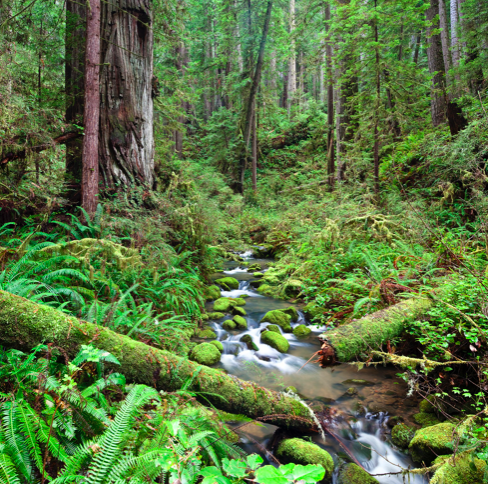 Humboldt Redwood Company to log adjacent to the BLM Headwaters Forest Reserve. Photo of BLM Headwaters Forest Reserve. This THP is about 5 miles NE of Fortuna, CA by the BLM Headwaters Forest Reserve (South Fork Elk River is adjacent) at an elevation of 500 to 1,500 feet. Humboldt Redwood Company is planning a mostly group selection tractor and cable logging operation on steep and unstable slopes in redwood, Douglas fir and grand fir forests. The THP area flows into the Elk River which is listed as an impaired watershed for sediment and siltation. There are 39 landslide terrain sites including; multiple steep inner gorges, debris slides, debris slide slopes, earth flows, disrupted ground, cut bank and fill slope failures. 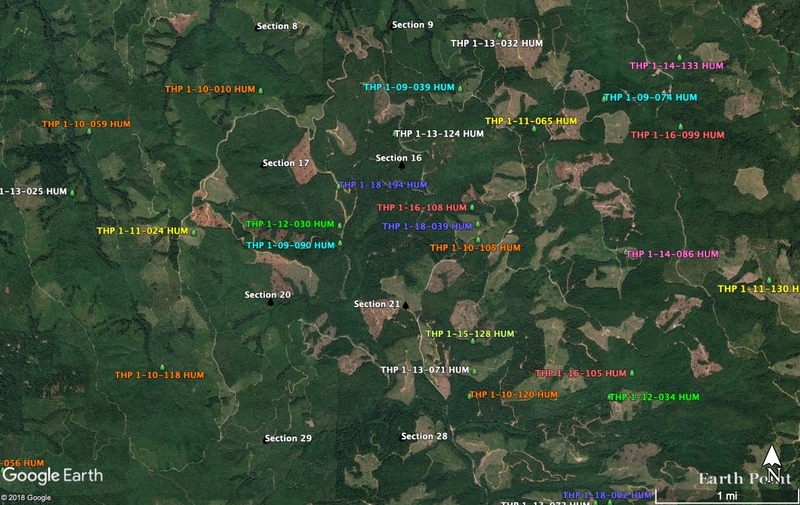 Humboldt Redwood Company is planning to use ground based equipment in areas designated for cable logging, use ground based equipment on an existing skid road in a class I (year round) watercourse area in unit 2, and construct 600 feet of the U08.61 road adjacent to an unstable area in unit 2. Six road drainage sites are planned for work including rocking, dip construction, ditch cleaning and culvert repair/replacement. There are 10 spotted owl nesting territories within 1.3 miles of the THP area. Mendocino Redwood Company to helicopter log south of Navarro, CA by the Navarro River. This THP is about 2 miles south of Navarro, CA, and about a mile west of Highway 128 by the Navarro River at an elevation of 140 to 600 feet. Mendocino Redwood Company is planning a transition and variable retention tractor, cable and helicopter (large tree) logging operation in redwood, Douglas fir and Monterey pine forests. The THP area flows into the Navarro River which is listed as an impaired watershed for sediment and temperature. There are 4 landslide terrain sites in unit C, and 15 road failure sites including; 3 fill failure sites, and 12 cut bank failure sites in the THP area. Mendocino Redwood Company is planning to use an existing landing that extends into a class I (year round) watercourse area adjacent to Kabuki Creek, and to use ground based equipment in areas designated for cable logging. 55 road drainage sites are planned for work including rocking, dip construction, ditch cleaning, culvert repair/replacement and restoration of washed out crossings. There is 1 spotted owl nesting territory within .7 miles of the THP area. Green Diamond Resource Company to clearcut log south of Klamath, CA and the Klamath River. This THP is just west of highway 101, about a mile south of Klamath, CA and the Klamath River at an elevation of 80 to 960 feet. Green Diamond Resource Company is planning a mostly clearcut tractor and cable logging operation on steep and unstable slopes in redwood, Douglas fir, Sitka spruce and western hemlock forests. There are 4 unstable areas in the THP area including; 1 shallow rapid landslide terrain site in unit C, and 3 shallow rapid landslide terrain sites in unit D. The THP area flows into the Lower Klamath River which is listed as an impaired watershed for sediment, temperature, nutrients and dissolved oxygen. Green Diamond Resource Company is planning to use ground based equipment in areas designated for cable logging at the top of unit D, and construct a segment of temporary road across an unstable area in unit C. They also are planning to use ground based equipment on an existing skid trail exceeding 20% grade for 100 feet along the NW portion of unit D. Five osprey nests are located within .25 miles of the THP area including; a nest within .25 miles of unit D, 3 nests across from Highway 101 within .25 miles of unit D, and a nest within .25 miles of units B, C and D. Five marbled murrelet stands are located in the THP area including; a stand within 300 feet of unit B, a stand within .25 miles of unit A, and a stand within .5 miles of unit A on Redwood National Park property. Foothill yellow legged frogs are known to occur .5 miles north of unit D in the Klamath River, and a great blue heron rockery is located 1.9 miles east of unit D. Spotted owl nesting territories are located within .25 miles of units B, C and D.
Mendocino Redwood Company to log on steep and unstable slopes SW of Leggett, CA. This THP is 5.5 miles SW of Leggett, CA, and about 3.5 miles NE of Rockport, CA on the Mendocino coastline at an elevation of 1,110 to 1,840 feet. Mendocino Redwood Company is planning a mostly group selection tractor based logging operation on steep and unstable slopes in Douglas fir and redwood forests. There is a large deep seated landslide terrain site in and above unit 14. 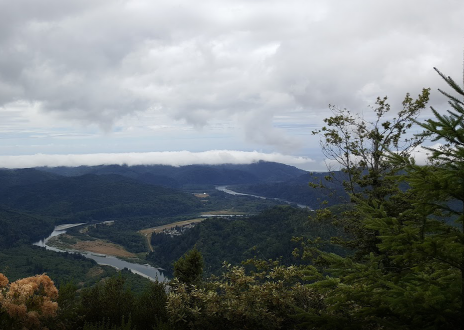 The THP area flows into the South Fork of the Eel River which is listed as an impaired watershed for sediment and temperature. Mendocino Redwood Company is planning to use ground based equipment on short segments of existing roads on slopes over 50% grade with a high erosion hazard rating, and use ground based equipment on slopes over 65% grade with a medium erosion hazard rating in units 1, 6 and 9. 49 road drainage sites are planned for work including rocking, dip construction, ditch cleaning and culvert repair/replacement. Robust false lupine was found on a seasonal road above units 2 and 3, and there are 4 spotted owl nesting territories within .7 miles of the THP area. 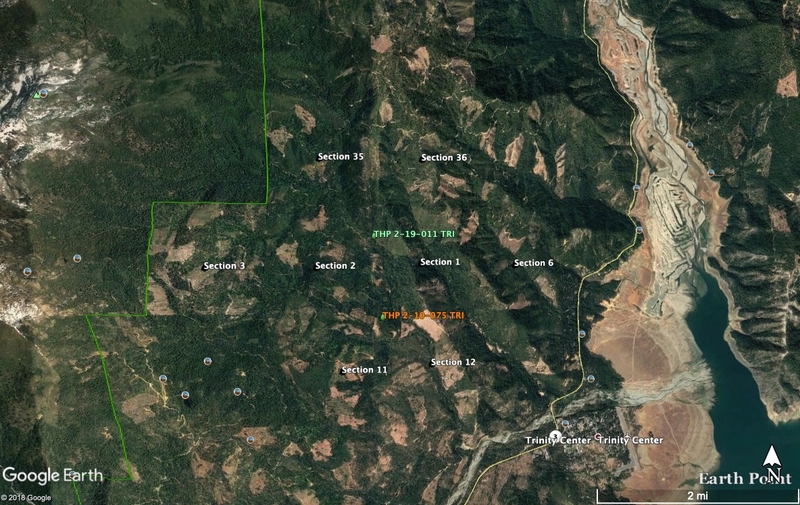 Green Diamond Resource Company to clearcut log SW of Willow Creek, CA. This THP is about 19 miles SE of Eureka, CA and about 13 miles SW of Willow Creek, CA at an elevation of 3,240 to 4,640 feet. Green Diamond Resource Company is planning a mostly clearcut tractor and cable logging operation in Douglas fir forests. The THP area flows into Redwood Creek which is listed as an impaired watershed for sediment and temperature. There are 4 unstable areas including; 3 shallow rapid landslide terrain sites in unit C, 1 shallow rapid landslide terrain site in unit H, and 2 road related unstable areas including; a fill slope failure off a haul road from unit B, and a small road related fill slope slump off a haul road from unit H. Green Diamond Resource Company is planning to construct a temporary steep road exceeding 20% grade for over 200 feet to access unit B, and construct 2 temporary steep roads exceeding 20% grade within units A and D. 15 road drainage sites are planned for work including rocking. dip construction, ditch cleaning and culvert repair/replacement. In 1990, a Pacific fisher was spotted inside unit A, and in 1994, a Cooper’s hawk was observed .52 miles NE of unit J. Southern torrent salamanders are known to occur in unit H, and immediately adjacent to unit I. There are spotted owl nesting territories within .25 miles of unit A, and within .5 miles of units B and J.
Humboldt Redwood Company to log SE of the BLM Headwaters Reserve near Fortuna, CA. This THP is about 6 miles NE of Fortuna, CA, 8 miles SE of Eureka, CA and just SE of the BLM Headwaters Forest Reserve at an elevation of 700 to 1,640 feet. Humboldt Redwood Company is planning a mostly group selection tractor based logging operation on steep and unstable slopes in redwood, Douglas fir and grand fir forests. The THP area flows into the Van Duzen River which is listed as an impaired watershed for sediment/sedimentation and temperature. There are 3 landslide terrain sites in the THP area including an unstable area in unit 1, and 2 unstable areas in unit 4 (large debris slide), and several older cut bank failures off the N67 road. 22 road drainage sites are planned for work including rocking, dip construction, ditch cleaning and culvert repair/replacement. 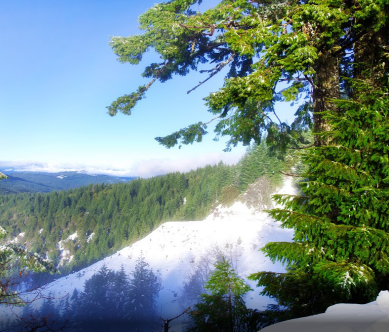 Marbled murrelet habitat is located adjacent to several haul roads, and there are 3 spotted owl nesting territories within 1.3 miles of the THP area. 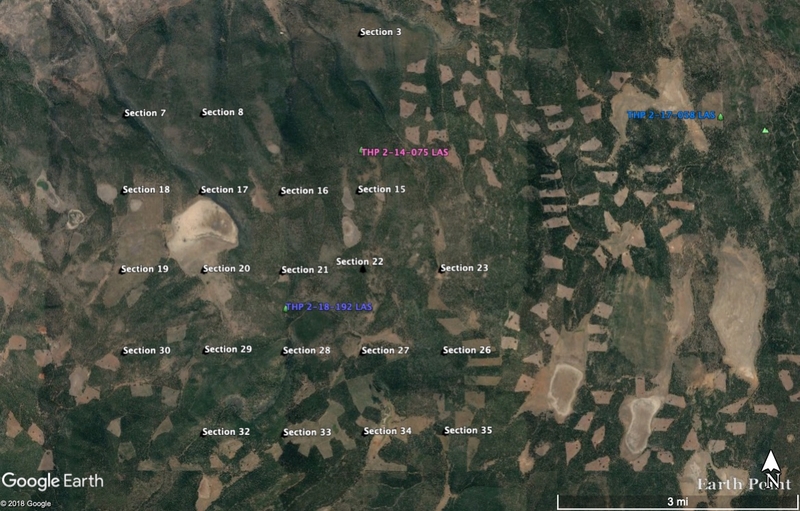 Green Diamond Resource Company to clearcut log north of Klamath, CA and the Klamath River. This THP is about 4 miles north of Klamath, CA and the Klamath River, and about 2 miles east of Highway 101 at an elevation of 200 to 1,800 feet. Green Diamond Resource Company is planning a mostly clearcut tractor and cable logging operation on steep and unstable slopes in redwood, Douglas fir, western hemlock, grand fir and Sitka spruce forests. The THP area flows into the Lower Klamath River which is listed as an impaired 303.d watershed for sediment, temperature, dissolved oxygen and nutrients. 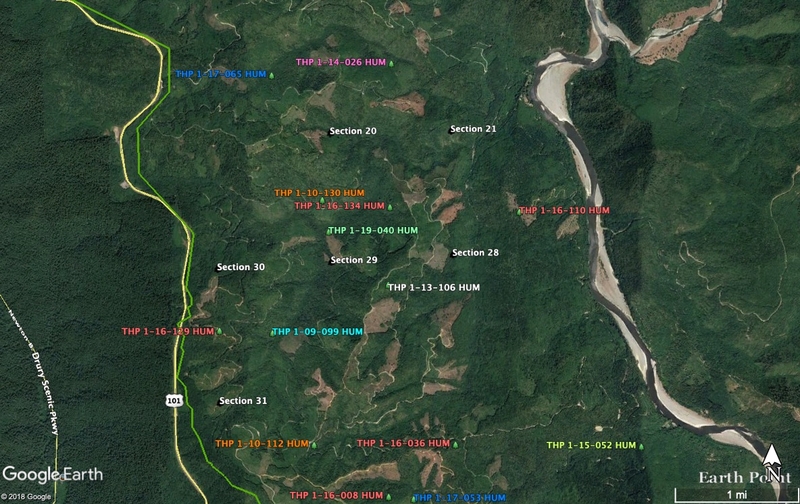 There are multiple road related fill failure and cut bank failures, and multiple shallow rapid landslide terrain sites in units E, F, H and G, and 1 deep seated landslide terrain site in unit H. Green Diamond Resource Company is planning to construct 5 segments of steep roads with grades exceeding 15%, and construct multiple short segments of roads through landslide terrain in units F and H. 24 road drainage sites are planned for work including rocking, dip construction, ditch cleaning, culvert repair/replacement and restoration of washed out crossings. 1 osprey nest is located within .25 miles of the H10 road, and 1 osprey nest is located within .25 miles of the H10 road and roads associated with unit M. There is marbled murrelet habitat on Forest Service and BLM land within 300 feet of units H and M, and within .25 miles of unit J. In 2011, a sharp shinned hawk nest was reported 760 feet north of unit I, and 90 feet west of the H10 road. Coastal tailed frogs and southern torrent salamanders are known to occur immediately adjacent to unit E, and foothill yellow legged frogs were reported 2,600 feet SE of unit F in Hunter Creek. There are spotted owl nesting territories within .25 miles of units H and I, and within .5 miles of units E, F, J, K and L.
Sierra Pacific Industries to clearcut log against the Trinity Alps Wilderness Area NE of Weaverville, CA. 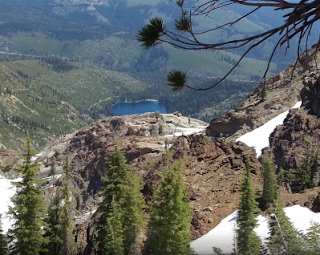 This THP is a few miles NW of Trinity Center, CA and Trinity Lake, and about 18 miles NE of Weaverville, CA at an elevation of 2,760 to 5,480 feet. Section 3 (unit 301 is up against the wilderness boundary) and section 35 are adjacent to the Trinity Alps Wilderness Area. Sierra Pacific Industries is planning a mostly clearcut tractor and cable logging operation on steep and unstable slopes (there are 10 unstable areas in section 35 outside of THP units) in Douglas fir, ponderosa pine, sugar pine, white fir and incense cedar forests. The use and construction of roads, landings and crossings is planned during the winter period. 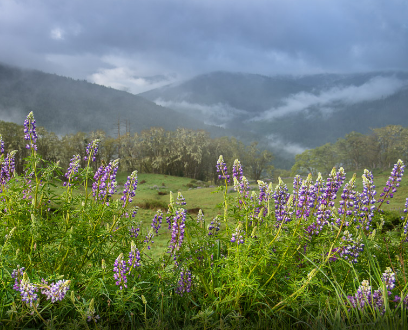 13 sensitive plant species were found including: Klamath Mountain catchfly in units 106, 202 and 3503, citrus fawn lily in the northern portion of unit 106 and within units 202 and 3503, clustered lady’s slipper in units 103 and 106, English peak greenbriar in unit 104, glaucous umbrellawort in unit 104, Shasta County arnica in unit 1202, slender goldbanner in unit 1202, Klamath manzanita south of unit 902, California pitcher plant in units 901 and 902, Congdon’s buckwheat in unit 901, redwood lily in units 201, 202, 3504 and 3505, Shasta lily in unit 103 and showy raillardella in units 103, 201, 202, 3504, 901, and 902. There are two spotted owl nesting territories within 1.3 miles of the THP area. Sierra Pacific Industries to clearcut and sanitation salvage log nice stands of higher elevation forest near Downieville, CA. This THP is about 18 miles north of I-80 and about 4 miles SE of Downieville, CA near the Middle Fork of the Yuba River at an elevation of 4,000 to 5,700 feet. 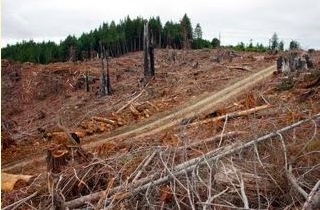 Sierra Pacific Industries is planning a clearcut and sanitation salvage tractor and cable logging operation in nice high elevation stands of white fir, red fir, incense cedar, Douglas fir, sugar pine and incense cedar forests. Section 31 is adjacent to the Middle Yuba Roadless Area, and 11 acres of logging is proposed inside late seral (large tree) stands within cable clearcut unit 30-0606. SPI is planning to construct 2 spur roads within watercourse areas, use an existing landing partially inside a class II (mid sized) watercourse area, construct 100 feet of road across a landslide area in section 21, and use ground based equipment on existing skid trails within a landslide area in section 31. 53 road drainage sites are planned for work including rocking, dip construction, ditch cleaning, and culvert repair/replacement. Foothill yellow legged frogs were reported within 1 mile (section 1), 1.6 miles (section 12), and 2.35 miles (section 6) from the nearest THP unit. Sierra valley lewisia was found in section 25 within THP units. CA spotted owls were reported within .1 mi (section 39), .3 miles (section 21), .8 miles (section 36), and 1 mile (section 27) from the nearest THP units. 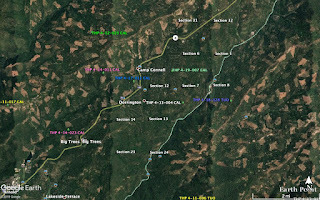 Green Diamond Resource Company to clearcut log north of Klamath, CA near Redwood National Park. This THP is about 8 miles north of Klamath, CA and about a mile east of Redwood National Park and Highway 101 at an elevation of 1,000 to 1,600 feet. Green Diamond Resource Company is planning a mostly clearcut tractor and cable logging operation on steep and unstable slopes in redwood, Douglas fir and western hemlock forests. 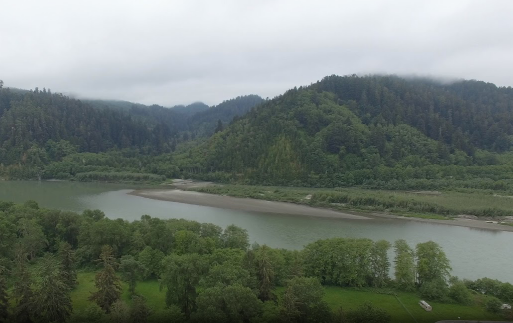 The THP area flows into the Lower Klamath River which is listed as an impaired watershed for sediment, temperature, dissolved oxygen and nutrients. There are 3 shallow rapid landslide terrain sites in unit G, and one road failure site caused by an edge failure from a shallow rapid landslide terrain site off the H-400 Road. 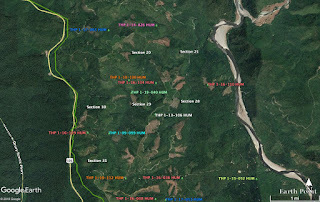 Green Diamond Resource Company is planning to re-construct 50 feet of the H-400 Road around a shallow rapid landslide that has disturbed the road shoulder. 14 road drainage sites are planned for work including rocking, dip construction, ditch cleaning, culvert repair/replacement and restoration of washed out crossings. There are 2 osprey nests within .25 miles of the W10 Road, a marbled murrelet stand within .25 miles of the W10 and H200 Roads, and a marbled murrelet stand 1 mile west of the THP area on Del Norte Redwoods State Park lands. Coastal tailed frogs are known to occur immediately adjacent to units A and D, southern torrent salamanders are known to occur immediately adjacent to unit D, and a sharp shinned hawk nest was reported within 90 feet of the H10 Road. There is a spotted owl nesting territory within .5 miles of unit F.
Sierra Pacific Industries to clearcut and fuel break log NE of Volcano, CA and Carson Pass Highway. This THP is about 15 miles SE of Placerville, CA, and about 7 miles NE of Volcano, CA near Highway 88 (Carson Pass Highway) at an elevation of 3,400 to 4,400 feet. Sierra Pacific Industries is planning a mostly clearcut and fuel break tractor and cable logging operation on steep and unstable slopes in ponderosa pine, incense cedar, Douglas fir, white fir and sugar pine forests. There are 4 unstable areas (debris slides and rock slides) in the THP area in and adjacent to units 2312 and 2267. SPI is planning to use ground based equipment in areas designated for cable logging, and use and construct roads, landings and crossings during the winter period. They also are planning to use and/or construct a landing and temporary roads across unstable areas in unit 2267, and use and/or construct roads within watercourse areas including; the construction of a seasonal road within a class III (intermittent) watercourse area on the western edge of unit 2418. 39 road drainage sites are planned for work including rocking, dip construction, ditch cleaning and culvert repair/replacement. Sierra clarkia was found just west of unit 2973, and in and around units 2199, and 2510, Coleman’s rein orchid was found on the western edge of unit 2167, and Pleasant valley mariposa lily was found on a ridge above unit 2973. There are 10 CA spotted owl nesting territories within 1.3 miles of the THP area. Sierra Pacific Industries planning a huge fuel break and clearcut logging operation adjacent to Dorrington, Camp Connell, Big Trees Village Subdivision and Calaveras Big Trees State Park. The THP area is approximately one mile east and SE of Dorrington, Camp Connell, Big Trees Village Subdivision and the eastern boundary of Calaveras Big Trees State Park. Sierra Pacific Industries is planning a fuel break and clear cut tractor and cable logging operation in ponderosa pine, sugar pine, white fir, and incense cedar forests at an elevation of 3,875 to 5,650 feet. 443 acres of fuel break prescription (up to 300 feet) centered along the perimeter of Big Trees Village Subdivision, and 26 acres of Special Treatment Area (fuel break prescription) is proposed adjacent to the eastern boundary of Calaveras Big Trees State Park. Three unstable areas are located in the THP area including; a .5 acre rotational landslide terrain site in unit 659, a 1.6 acre area of rotational slips and slumps adjacent to unit 659, and 3 acres of rotational slumps adjacent to and within unit FB 9. SPI is planning to use ground based equipment on steep slopes over 65%, and on slopes over 50% with a high erosion hazard in unit 664, and use ground based equipment on slopes over 50% grade that does not flatten before reaching a watercourse area in unit 623. They also are planning to use a 425 foot segment of existing skid trail inside a class II (mid sized) watercourse area adjacent to unit 623, and use a 100 foot segment of skid trail inside a class II (mid sized) watercourse area adjacent to unit 663. In 1998, a northern goshawk nest site was reported .5 miles from the nearest THP unit in section 32, and an historic (1953) report describes a Sierra Nevada yellow legged frog within 1 mile of the THP area in section 12. 30 road drainage sites are planned for work including rocking, dip construction, ditch cleaning and culvert repair/replacement. Stebbins desert parsley was found adjacent to unit 629, and there are 10 CA spotted owl nesting territories within 1.3 miles of the THP area. This THP is about 7 miles NE of Orick, CA, between Redwood National Park and the Klamath River at an elevation of 510 to 2,120 feet. Green Diamond Resource Company is planning a mostly clearcut tractor and cable logging operation on steep and unstable slopes in redwood, Douglas fir and western hemlock forests. 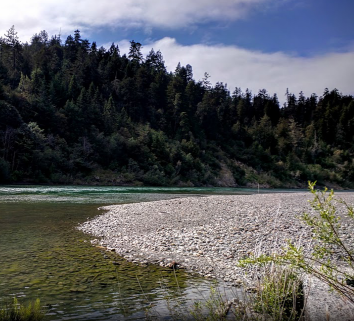 The THP area flows into the Lower Klamath River which is listed as an impaired watershed for sediment, temperature, dissolved oxygen and nutrients. There is 1 shallow rapid landslide terrain site in unit A, 5 shallow rapid landslides in unit B, and 1 shallow rapid landslide terrain site in unit B. Potential marbled murrelet habitat exists 1.4 miles west of unit A, 1.5 miles east of the THP area, and within .25 miles of the TT-100 Road. In 1990, a Del Norte salamander was reported in unit B, and in 1990, a foothill yellow legged frog was reported adjacent to unit B. There are 15 road drainage sites planned for work including rocking, dip construction, ditch cleaning and culvert repair/replacement. Five spotted owl nesting territories are located within 1.3 miles of the THP area. 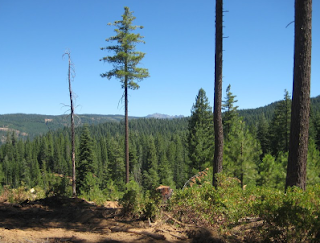 Sierra Pacific Industries to clearcut log NW of Susanville, CA. This THP is about 25 miles NW of Susanville, CA and about 22 miles SE of Bieber, CA at an elevation of 5,040 to 6,720 feet. Sierra Pacific Industries is planning a tractor based logging operation in ponderosa pine, Jeffrey pine, white fir, sugar pine and incense cedar forests. 17 seasonal roads are proposed for construction (6.78 miles), and 14 segments of roads are proposed for construction within and/or adjacent to class III (intermittent) watercourse areas (2.32 miles). 60 road drainage sites are planned for work including rocking, dip construction, ditch cleaning and culvert repair/replacement. A bald eagle nest site is located 375 feet east of unit 244, a bald eagle nest site is located 895 feet east of unit 244, and a goshawk nest site is located 1,000 feet south of unit 279. Grater sandhill crane sightings were reported nearby at Mosquito Flat and Ashurt Well. Foothill arnica was found adjacent to units 244, 245, and within or adjacent to units 247 and 305, and Egg Lake monkey flower was found west of unit 244, and in the north and east portions of section 27. Wolly mock goldenweed was found in the northern portion of unit 27, and Liddon sedge was found adjacent to unit 228. There is one CA spotted owl nesting territory within 1.3 miles of the THP area. Humboldt Redwood Company to log adjacent to 2 large tree marbled murrelet stands NE of Scotia, CA. This THP is about 10 miles SE of Fortuna, CA, 7 miles NE of Scotia, CA and about 3 miles north of Highway 36 at an elevation of 640 to 2,360 feet. 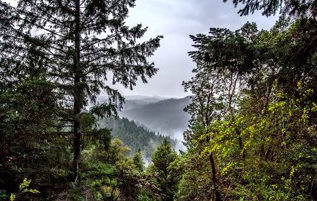 Humboldt Redwood Company is planning a mostly group selection (logging is planned around 2 high quality large tree marbled murrelet stands (433D and 496D) within unit 1) tractor based logging operation on steep and unstable slopes in redwood and Douglas fir forests. The THP area flows into the Van Duzen River which is listed as an impaired watershed for sediment/sedimentation and temperature. There is a large debris slide at the intersection of the L35 and L35.54 roads, and an earth flow in unit 1. Humboldt Redwood Company is planning to use ground based equipment on unstable areas, and use ground based equipment at 2 locations within class II (mid sized) watercourse areas in unit 1. Eleven road drainage sites are planned for work including rocking, dip construction, ditch cleaning and culvert repair/replacement. There are 8 spotted owl nesting territories within 1.3 miles of the THP area. Green Diamond Resource Company to clearcut log north of Smith River, CA. This THP is about a mile north of the town of Smith River, CA and a few miles south of the CA/OR border at an elevation of 30 to 1,040 feet. Green Diamond Resource Company is planning a mostly clearcut tractor and cable logging operation on steep and unstable slopes in redwood, Douglas fir, western hemlock and Sitka spruce forests. There are multiple landslide terrain sites in the THP area including; 1 deep seated landslide terrain site, and 3 shallow rapid landslide terrain sites in unit A, a shallow rapid landslide terrain site and road failure site (WI-1420 Road) in unit B, a shallow rapid landslide terrain site in unit D, and a shallow rapid landslide terrain site in unit E. Green Diamond Resource Company is planning to use ground based equipment on an unstable area to re-open the WI-1420 Road, and re-construct a steep segment of seasonal road in unit B exceeding 20% grade for over 200 feet. 20 road drainage sites are planned for work including rocking, dip construction, ditch cleaning, culvert repair/replacement and restoration of washed out crossings. Marbled murrelet habitat is located on SIskiyou National Park lands within .25 miles of the WI-1000 Road, two great blue heron rockeries are located greater than .5 miles SW of unit F, and a bank swallow nesting colony is located at Lopez Creek, 1.6 miles west of unit H. There are spotted owl nesting territories within .25 miles of unit G, and within .5 miles of unit B. This THP is about 6 miles NE of McKinleyville, CA and about 5 miles south of Redwood National Park at an elevation of 720 to 1,680 feet. Green Diamond Resource Company is planning a mostly clearcut tractor and cable logging operation on steep and unstable slopes (3 unstable areas in units C and G) in redwood, Douglas fir, grand fir and western hemlock forests. The THP area flows into the north fork of the Mad River which is listed as an impaired watershed for sediment, temperature and turbidity. Green Diamond Resource Company is planning to use ground based shovel yarding equipment to operate on 3 segments of permanent rocked road within class I (year round), and class II (mid sized) watercourse areas. Six road drainage sites are planned for work including rocking, dip construction, ditch cleaning and culvert repair/replacement. In 2015, a ruffed grouse was spotted in unit B, and in 2010, a Cooper’s hawk was spotted 2.2 miles east of unit G. Coastal tailed frogs are known to occur within 1,000 feet of units D, E and F, southern torrent salamanders are known to occur within 1,000 feet of units A and G, and foothill yellow legged frogs have been reported 4,000 feet east of unit G. There are spotted owl nesting territories within .25 miles of units E and F, and within .5 miles of units D and G.
Green Diamond Resource Company to clearcut log by the Klamath River. This THP is a few miles SE of Klamath, CA near the Klamath River at an elevation of 40 to 1,000 feet. Green Diamond Resource Company is planning a mostly clearcut tractor and cable logging operation in Douglas fir, redwood, western hemlock, Sitka spruce, Monterey pine and Port Orford cedar forests. There are 7 unstable areas in the THP area including; 1 shallow rapid landslide terrain site along the western boundary of unit B, 4 shallow rapid landslide and 1 deep seated landslide terrain sites in unit E, and 1 shallow rapid landslide terrain site in unit G. The THP area flows into the Lower Klamath River watershed which is listed as an impaired watershed for sediment, temperature, dissolved oxygen and nutrients. Three temporary and seasonal roads are proposed for construction on steep slopes including; a temporary road exceeding 20% grade for 200 feet in unit A, a temporary spur road exceeding 20% grade for 100 feet in unit A, and a seasonal road exceeding 20% grade above the MG-10 Road in unit G. Nine road drainage sites are planned for work including rocking, dip construction, ditch cleaning, culvert repair/replacement and restoration of washed out crossings. 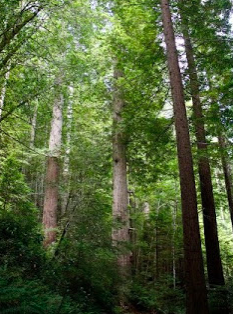 There is potential marbled murrelet habitat within .25 miles of the SA-10 Road on Prairie Creek Redwoods State Park lands. 14 osprey nests sites are located in the THP area including; 9 nests sites within .25 miles of the MG-10 Road, 1 nest site within .25 miles of unit D and the SA-10 Road, 1 nest site within 165 feet of unit A, 1 nest site within .25 miles of unit A, 1 nest site within .25 miles of seasonal haul roads, and 1 nest site within 165 feet of unit E and within .25 miles of the MG-10 Road and MG-900 Road. Three bald eagle nest sites are located within .5 miles of the THP area including; 1 nest within .5 miles of units B, C, D, 1 nest within .5 miles of units A, B, C, D, and 1 nest within .5 miles of roads near unit A. A great blue heron rockery is located within .25 miles of roads leading up to unit A, and a historic (1998) great blue heron rockery is located 350 feet east of the MG-10 Road and 690 feet north of unit D. Foothill yellow legged frogs are known to occur in McGarvey Creek, immediately adjacent to units D and E.
This THP is about 8 miles SE of Orick, CA and about 4 miles east of Redwood National Park at an elevation of 1,200 to 2,400 feet. 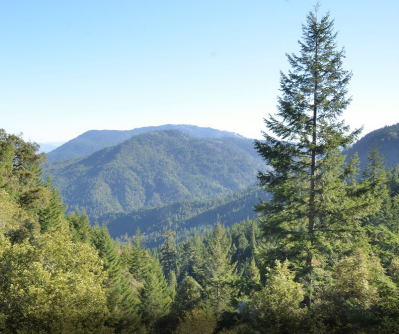 Green Diamond Resource Company is planning a mostly clearcut tractor and cable logging operation on steep and unstable slopes in Douglas fir and redwood forests. There are 23 unstable areas in the THP area including; 5 shallow rapid landslides in unit A, 8 shallow rapid landslides in unit B, 8 shallow rapid landslides and 2 deep seated landslides in unit F. The THP area flows into the Lower Klamath River watershed which is listed as an impaired watershed for sediment, temperature, dissolved oxygen and nutrients. Green Diamond Resource Company is planning to construct a landing between 2 watercourse areas. 12 road drainage sites are planned for work including rocking, dip construction, ditch cleaning, culvert repair/replacement and restoration of washed out crossings. 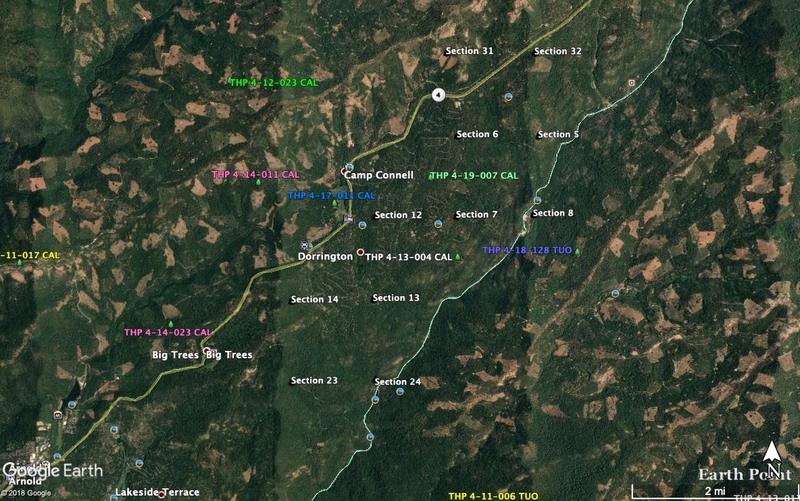 Golden eagles have been reported within .5 miles of units A, B, C, D and E, and there are spotted owl nesting territories within .25 miles of units B, C and F, and within .5 miles of units D and E.
Green Diamond Resource Company to clearcut log south of the CA/OR Border. This THP is about 2 miles NE of Smith River, CA and about 2 miles south of the CA/OR border at an elevation of 800 to 2,000 feet. 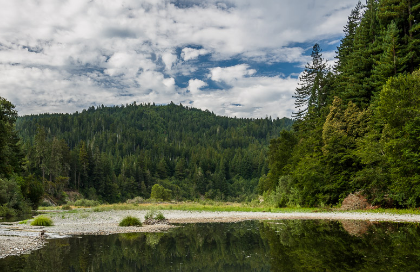 Green Diamond Resource Company is planning a mostly clearcut tractor and cable logging operation in redwood, Douglas fir and western hemlock forests. There are shallow rapid landslides in units A and F. Eight road drainage sites are planned for work including rocking, dip construction, ditch cleaning and culvert repair/replacement. Southern torrent salamanders are known to occur in unit E, and there are spotted owl nesting territories within .5 miles of units A, B and E.
Sierra Pacific Industries to log in nice high elevation stands south of Sierra City, CA. This THP is about 4 miles south of Sierra City, CA and Highway 49, and about 12 miles north of Emigrant Gap and Interstate 80 at an elevation of 6,000 to 7,300 feet. Sierra Pacific Industries is planning a shelterwood and group selection tractor and cable logging operation in nice high elevation stands of Douglas fir, ponderosa pine, white fir, Jeffrey pine, sugar pine, incense cedar, lodgepole pine and red fir forests. The construction and use of temporary crossings, roads and landings is proposed during the winter period. Rocky Mountain chickweed was found in unit B, Sierra starwort was reported inside units A, B, C, D, E, H and I, and Lahonton cutthroat trout were introduced into the upper reaches of Macklin Creek. Three CA spotted owl sightings were reported within .3 miles of the nearest harvest unit in section 21. 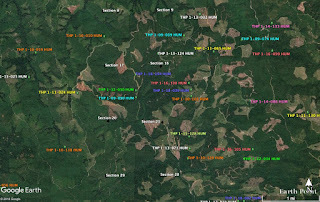 Green Diamond Resource Company to clearcut log trees up to 60” dbh NE of Trinidad, CA. This THP is about 3 miles NE of Trinidad, CA and Highway 101 at an elevation of 480 to 1,400 feet. Green Diamond Resource Company is planning a mostly clearcut tractor and cable logging operation on steep and unstable slopes in redwood, Douglas fir, Sitka spruce, grand fir and western hemlock forests. There is a .10 acre shallow rapid landslide in the interior of unit B, a .75 acre shallow rapid landslide in the interior of unit B, and a steep headwall swale in the interior of unit B. Five osprey nests are located within .25 miles of the THP area including; 1 nest within .25 miles of the LP Mill Road, 1 nest within .25 miles of the BL3200 Road, 1 nest within .25 miles of the CR2400 Road, 1 nest within .25 miles of unit A, and 1 nest within .25 miles of unit B. Potential marbled murrelet habitat exists on Humboldt Redwoods State Park lands within .25 miles of the LP Mill Road. A sharp shinned hawk was reported .3 miles NE of unit A, and there are spotted owl nesting territories within .25 miles of unit C.
Green Diamond Resource Company to clearcut log SE of Orick, CA. This THP is about 6 miles SE of Orick, CA and Highway 101 and about 2 miles east of Redwood National Park at an elevation of 1,560 to 2,280 feet. Green Diamond Resource Company is planning a mostly clearcut tractor and cable logging operation on steep and unstable slopes in Douglas fir and western hemlock forests. There are numerous small slope failures in close proximity to watercourse areas. The THP area flows into the Lower Klamath River watershed which is listed as an impaired watershed for sediment, temperature, dissolved oxygen and nutrients. 21 road drainage sites are planned for work including rocking, dip construction, ditch cleaning and culvert repair/replacement. 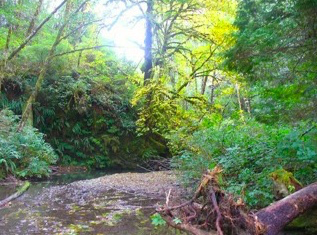 Marbled murrelet habitat is located 1.8 miles west of the THP area, foothill yellow legged frogs were reported 6,000 feet west of unit A, and coastal tailed frogs and southern torrent salamanders were reported 350 feet downstream of unit D in Tectah Creek. There are spotted owl nesting territories within .5 miles of units A and B. 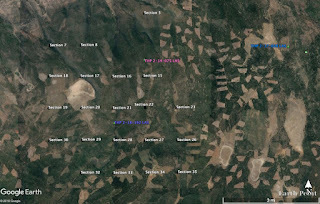 Green Diamond Resource Company to clearcut log NE of Klamath, CA and the Klamath River. This THP is about 4.5 miles NE of Klamath, CA and about 3 miles north of the Klamath River at an elevation of 1,000 to 2,000 feet. Green Diamond Resource Company is planning a mostly clearcut tractor and cable logging operation on steep and unstable slopes in redwood, Douglas fir and western hemlock forests. There are 2 unstable areas including; a shallow rapid landslide on the west side of unit A, and a shallow rapid landslide in unit C. The THP area flows into the Lower Klamath River which is listed as an impaired watershed for sediment, temperature, nutrients and dissolved oxygen. Green Diamond Resource Company is planning to construct a temporary road within 100 feet of a watercourse area on slopes exceeding 50% grade. They also are planning to re-construct; 2 segments of steep road in unit A, 1 segment of steep road in unit C, and 1 segment of steep road in unit D, that exceeds 15% grade, and/or has short pitches exceeding 20% grade for distances greater than 500 feet. 13 road drainage sites are planned for work including rocking, dip construction, ditch cleaning and culvert repair/replacement. In 2001, a marten was detected 1.5 miles east of unit E, and 2 osprey nests are located within .25 miles of the B-10 road. There is marbled murrelet habitat within .25 miles of the B-10 road, and within 790 feet of the U-10 road. In 1997, a sharp shinned hawk was reported .2 miles east of unit A, coastal tailed frogs were reported 4,000 feet SW of unit E, southern torrent salamanders are known to occur immediately adjacent to unit A, and a foothill yellow legged frog was reported 2,500 feet west of unit A in Turwar Creek. Spotted owl nesting territories are located within .25 miles of unit A, and within .5 miles of units B and E.